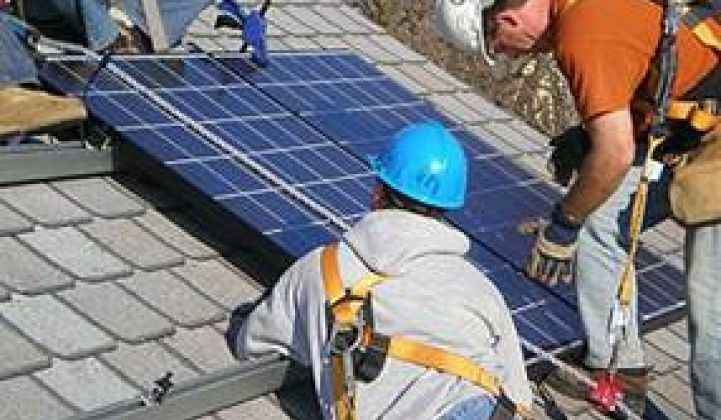 The newest push by the U.S. Department of Energy (DOE) SunShot Program is to deal with the soft costs of distributed solar. SunShot’s aim is to bring the price of solar -- unsubsidized -- to parity with the most affordable sources of grid electricity supply. 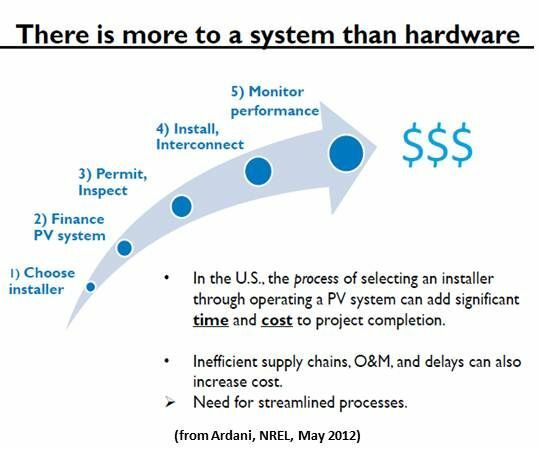 To do that, DOE wants to cut the total installed cost of a photovoltaic (PV) system to $1 per watt, or about 6 cents per kilowatt-hour. GTM Research's most recent U.S. Solar Market Insight report put the average U.S. installed price at $5.89 per watt. The most recent German installed solar system price, GTM Editor-in-Chief Eric Wesoff recently noted, was $2.24 per watt peak. If module and inverter prices are assumed to be about the same in both countries, that big difference must be in the soft costs of installing a system. Genability says its software can help reduce those soft costs. Apparently, the DOE sees promise -- it recently awarded the San Francisco-based startup a grant for its platform to help installers provide accurate bids in less time, optimize the system size and tariff, and make collaboration and communication between soft cost providers easier. “Soft costs, according to the DOE,” explained Genability Founder and CEO Jason Riley, “include customer acquisition and installer overhead, financing and contracting, permitting, inspection, and interconnection, and installation and performance." A recently announced round of SunShot grants went to companies with ideas about how to deal with soft costs including Genability ($500,000), Clean Energy Experts LLC ($495,040), Clean Power Finance ($1.5 million), concept3D Inc. ($1,275,791), Distributed Energy Research & Solutions Inc. ($500,000), Simply Civic LLC ($499,510), Solar Mosaic Berkeley ($2 million), Tigo Energy Inc. ($500,000) and Urban Glue ($402,050). In giving these awards to an array of companies with plans to attack soft costs, the DOE hedged its bets. The solution may come from an aggressive startup like Genability or a power player like Clean Power Finance. The $500,000 grant to Genability was “to develop web, API and data tools to automate accurate calculations of the economics of solar,” explained Genability’s Riley. “Soft costs, or total non-hardware costs, are around 50 percent for residential,” Riley said. 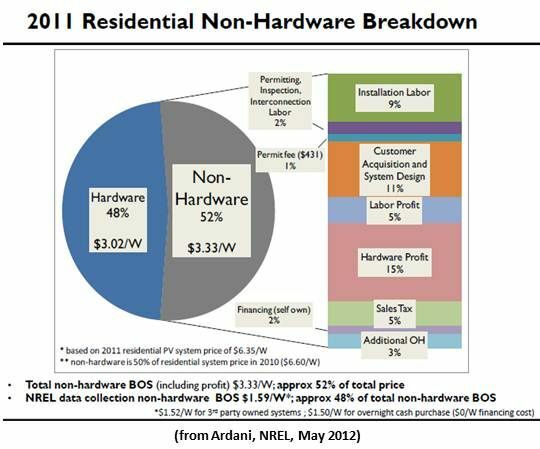 He cited a 2012 NREL report that put the installed cost of a five kilowatt U.S. residential PV system at $6.35 per watt and the non-hardware BOS cost at $3.33 per watt, or 52 percent of the total cost. Calculating how much an electricity bill is reduced when a system owner gets power from a solar system, Riley said, is “tricky and inexact.” Genability’s software, he explained, will make that calculation more precise by integrating solar system modeling and monitoring tools, tariff rate databases and engines, and usage data sources. As a winner in a tough DOE competition, Riley’s optimism is understandable. But in the wake of the Department of Commerce’s imposition of tariffs on modules imported from China and the loss at the end of last year of the 1603 manufacturing tax credit, module prices are expected to rise significantly. And demand is expected to drop off in the crucial California, New Jersey and Arizona markets due to incentive and political changes. So it may be a little harder to drive costs down than Riley now believes.